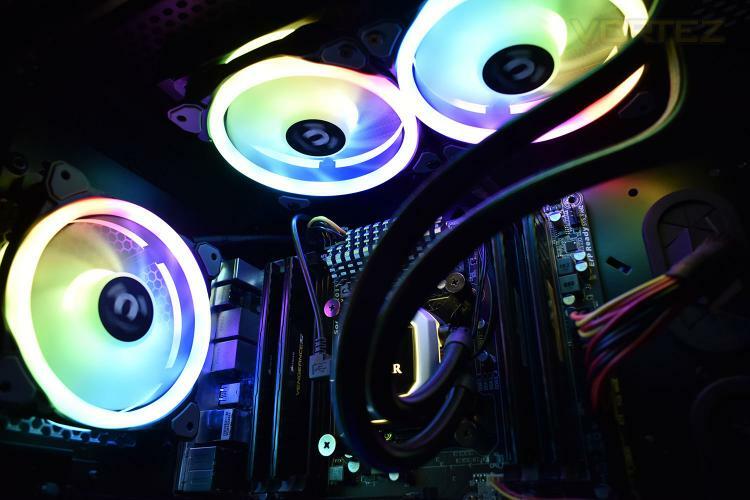 Almost a year ago, Thermaltake provided us with their Riing Plus 12 RGB fans, we rated them highly and thought they brought a great deal of RGB to any case they were placed in. Well today we look at the latest release, the Riing Trio 12 RGB. Again, these fans arrive in a triple-pack with a controller and all associated fixings required to get you up and running. One of the main improvements over the previous iteration is the introduction of an extra 20 RGB LEDs in each fan, making a total of 30. Those LEDs are divided up into three separate zones now, with individual illumination on the front and back and now in the motor-hub as well. Not only have Thermaltake improved the RGB LED layout, they’ve added several new features to their software suite, including Amazon Alexa and Razer Synapse support along with voice activation via the new mobile app. The fans themselves measure 120mm x 120mm x 25mm so they should fit in almost any situation where a typical 120mm fan would be used and thanks to hydraulics bearings and rubber mountings, noise is promised to be low. With the market obsession of RGB lighting and a need for constantly improved cooling capacity due to power-hungry components, the Riing Trio 12 fans certainly seem to fit the bill, but do they perform or look as good as Thermaltake claim? Let’s find out.